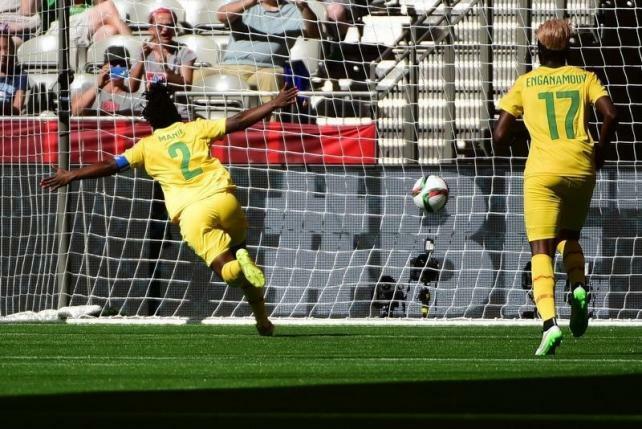 VANCOUVER – Gaelle Enganamouit scored a hat-trick as Cameroon belied their lowly world ranking of 53rd with a commanding 6-0 victory over fellow Women’s World Cup debutants Ecuador in their Group C opener in Vancouver on Monday. Les Lionnes, who qualified for the World Cup by finishing as runners-up at last year’s African Women’s Championship, took advantage of several defensive lapses by Ecuador with a three-goal burst in 11 minutes during the first half. Madelaine Ngono Mani pounced on a rebound to score the opening goal in the 34th minute before fellow forward Enganamouit made it 2-0 just two minutes later with a right-footed blast. The speedy Cameroon forwards dominated up front and Christine Manie struck from the penalty spot in the 44th minute after sending Ecuador goalkeeper Shirley Berruz the wrong way, burying the ball low to the left with a thunderous shot. Ecuador were reduced to 10 players when defender Ligia Moreira was red carded in the 66th minute and Enganamouit took advantage seven minutes later when she found the back of the net from close range.